The field of membrane separation technology is presently in a state of rapid growth and innovation. Many different membrane separation processes have been developed during the past half century and new processes are constantly emerging from academic, industrial, and governmental laboratories. While new membrane separation processes are being conceived with remarkable frequency, existing processes are also being constantly improved in order to enhance their economic competitiveness. Significant improvements are currently being made in many aspects of membrane separation technology: in the development of new membrane materials with higher selectivity and/or permeability, in the fabrication methods for high-flux asymmetric or composite membranes, in membrane module construction and in process design. Membrane separation technology is presently being used in an impressive variety of applications and has generated businesses totalling over one billion U.S. dollars annually. 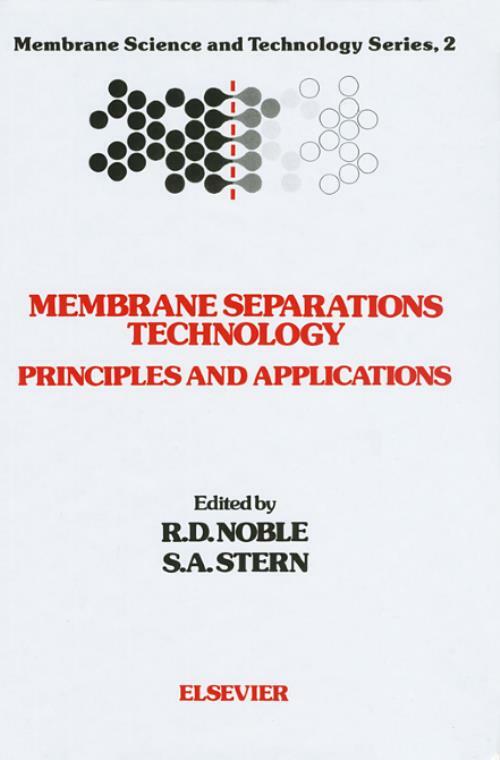 The main objective of this book is to present the principles and applications of a variety of membrane separation processes from the unique perspectives of investigators who have made important contributions to their fields. Another objective is to provide the reader with an authoritative resource on various aspects of this rapidly growing technology. The text can be used by someone who wishes to learn about a general area of application as well as by the knowledgeable person seeking more detailed information. 1. Microfiltration and ultrafiltration (W. Eykamp). 2. Polarization phenomena and membrane fouling (M.H.V. Mulder). 3. Vapor permeation (Y. Cen, R.N. Lichtenthaler). 4. Reverse osmosis (C.J.D. Fell). 5. Pervaporation (J. Néel). 6. Electrodialysis and related processes (H. Strathmann). 7. Liquid membranes (liquid pertraction) (L. Boyadzhiev, Z. Lazarova). 8. Membrane bioseparations (S.L. Matson). 9. Food and beverage industry applications (M. Cheryan, J.R. Alvarez). 10. Membrane contactors (B.W. Reed, M.J. Semmens, E.L. Cussler). 11. Analysis and design of membrane permeators for gas separation (A. Sengupta, K.K. Sirkar). 12. Gas separation using inorganic membranes (K. Keizer, R.J.R. Uhlhorn, A.J. Burggraaf). 13. Economics of gas separation membrane processes (R. Spillman). 14. Catalytic membrane reactors (J.L. Falconer, R.D. Noble, D. Sperry). Subject index.